"Diggers 'n Dozers" Lil' Bits is one you that won't want to miss. The construction is already completed on several items, so you get the fun of the finished product! Elements in the Lil' Bits are NOT included in the "Diggers 'n Dozers" FQB. 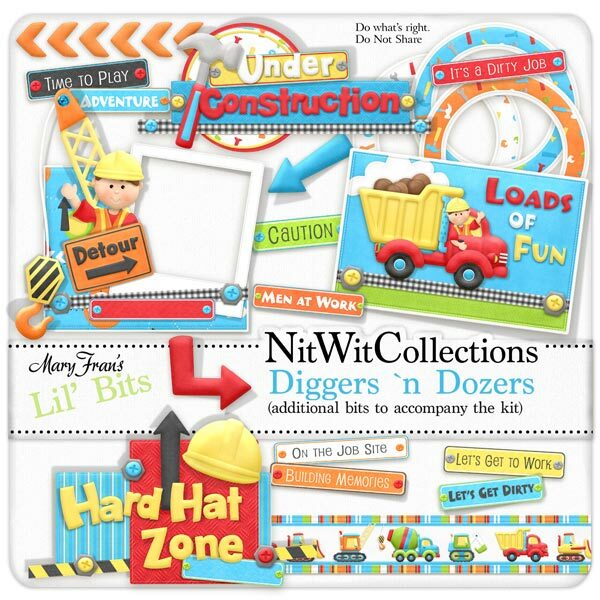 1 Wordart - "Hard Hat Zone"
1 Wordart - "Loads of Fun" and it really is! 1 Wordart - " Under Construction" very fitting, don't you think? 9 Wordstrips for easy placement that may give you the words for your layout or card.